400% Welcome Bonus 1. The 400% welcome bonus is only redeemable upon a player/household/computer’s initial approved deposit. 2. 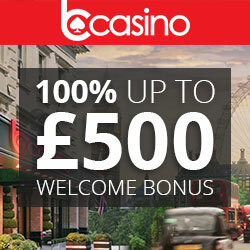 The 400% bonus is available up to the value of €1000. For example, if you deposit €50 you will receive a bonus of €200 amounting to a total balance of €250 3. The bonus balance together with the deposited balance is subject to 30 times wagering requirements before withdrawal can be made. * 10 Free Spins are credited upon your first deposit, valued at 10p per spin and to be used on Wild Heist slot • Winnings are uncapped and have no wagering requirement • Minimum deposit £10 • New customers only • Full T&Cs apply.